C. Sansone and J.M. Harackiewicz, Looking Beyond Rewards: The Problem and Promise of Intrinsic Motivation. R.M. Ryan and E.L. Deci, When Rewards Compete with Nature: The Undermining of Intrinsic Motivation and Self-Regulation. B.A. Hennessey, Rewards and Creativity. J.M. Harackiewicz and C. Sansone, Rewarding Competence: The Importance of Goals in the Study of Intrinsic Motivation. J.Y. Shah and A.W. Kruglanski, The Structure and Substance of Intrinsic Motivation. D.C. Molden and C.S. Dweck, Meaning and Motivation. R. Butler, What Learners Want to Know: The Role of Achievement Goals in Shaping Information Seeking, Learning, and Interest. E.A. Linnenbrink and P.R. Pintrich, Multiple Pathways to Learning and Achievement: Teh Role of Goal Orientation in Fostering Adaptive Motivation, Affect, and Cognition. K.E. Barron and J.M. Harackiewicz, Achievement Goals and Optimal Motivation: A Multiple Goals Approach. M.R. Lepper and J. Henderlong, Turning "Play" Into "Work" and "Work" Into "Play": 25 Years of Research on Intrinsic Versus Extrinsic Motivation. 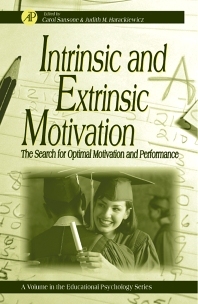 S. Hidi, An Interest Researcher's Perspective: The Effects of Extrinsic and Intrinsic Factors on Motivation. C. Sansone and J.L. Smith, Interest and Self-Regulation: The Relation Between Having to and Wanting to. K.A. Renninger, Individual Interest and its Implications for Understanding Intrinsic Motivation. J.E. Jacobs and J.S. Eccles, Parents, Task Values, and Real-Life Achievement-Related Choices. C. Sansone and J.M. Harackiewicz, Controversies and New Directions - is it Deja Vu All Over Again? Index. Academic researchers in educational, cognitive, and social psychology. University of Wisconsin, Madison, U.S.A.